I know a lot of people suffering from plantar fasciitis, and I’ve seen first-hand the toll it can take. People with chronic pain are generally desperate enough to try anything or buy anything that relieves their pain. Sometimes they get duped because they’re blinded by marketing tactics and don’t choose according to their needs. 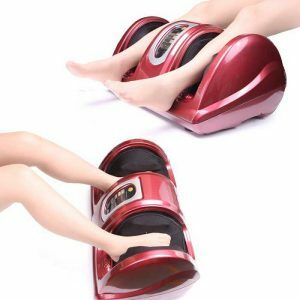 So if you want to invest in the best foot massager that help to deal with your specific problem or relief pain read this review. The Miko Shiatsu Foot Massager, with its deep kneading, rolling, vibrating and heat functions, targets the precise pressure points a therapist would massage. Besides, the 5 pressure settings and massage techniques help stabilize your ankle and heel. 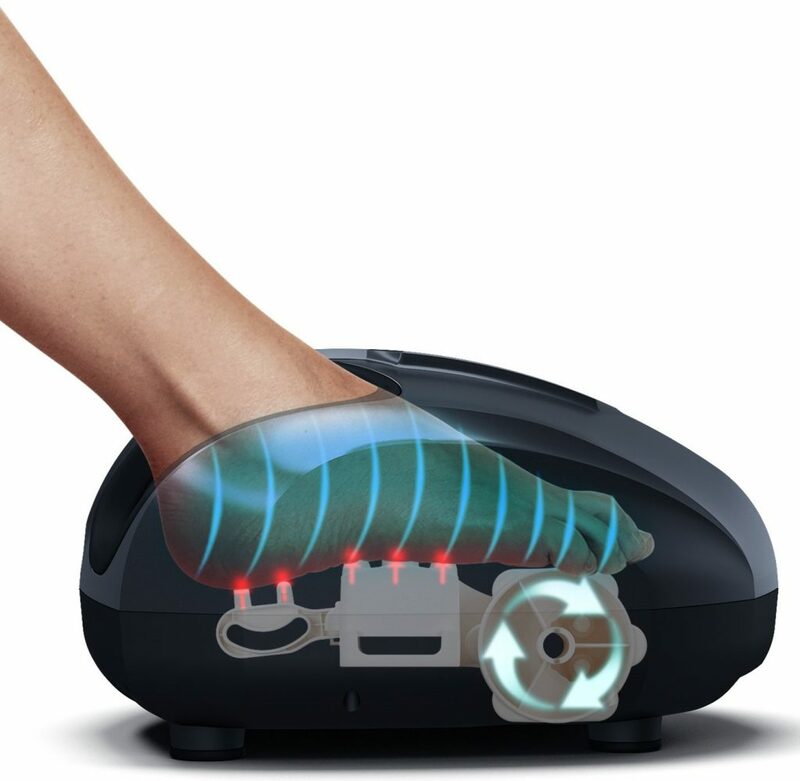 With a 1-year warranty and functionally separated foot chambers, the Miko foot massager is sleek and easy to customize. However, it doesn’t target your heels unless you have small feet – but the deep kneading massage on your arch is just what you need to get rid of plantar fasciitis. I loved the Shiatsu massage therapy combined with air pressure. The Shiatsu nodes are powerful enough to decrease all sorts of pain and relieve tired muscles. Not to mention the center control panel with soft-touch buttons is easy to use. This is a portable, low-maintenance and compact foot massager – you can carry it to your office, or store it under the sofa. And I also like the heat feature, it really helps unwind sore muscles, plus it feels like actual human hands. It would’ve been better if the heat could be more powerful, though. 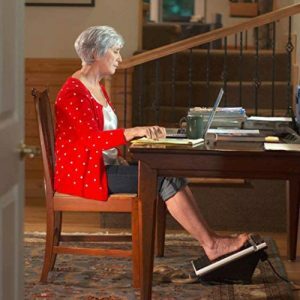 Summary: A functional, customizable and easy-to-use unit, the Miko foot massager boasts deep-kneading massage nodes and airbags to relieve plantar fasciitis pain. 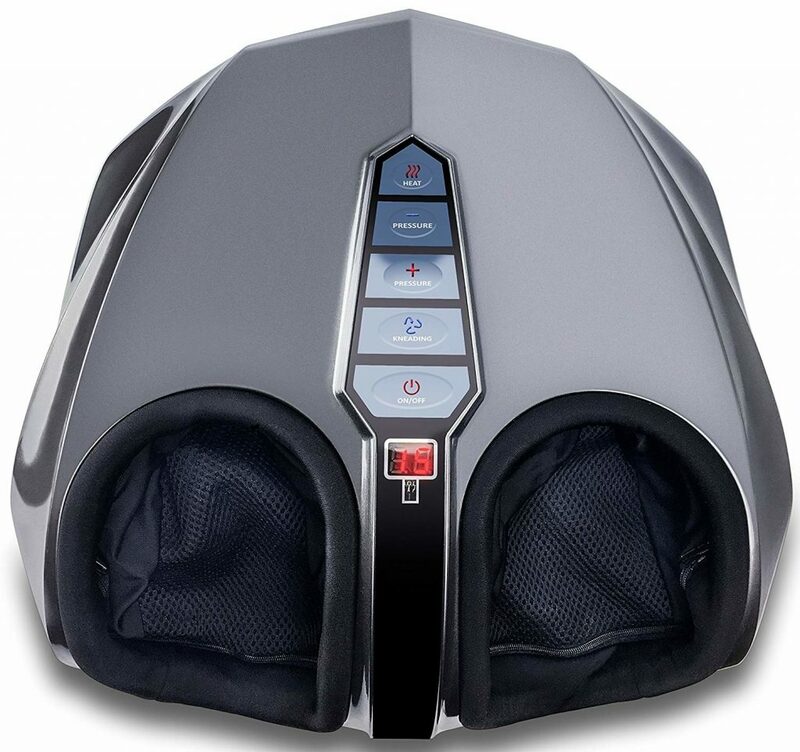 The MedMassager MMF06 is the best professional feet device because it boasts 11 speeds from 1000 to 3,7000 rpm. 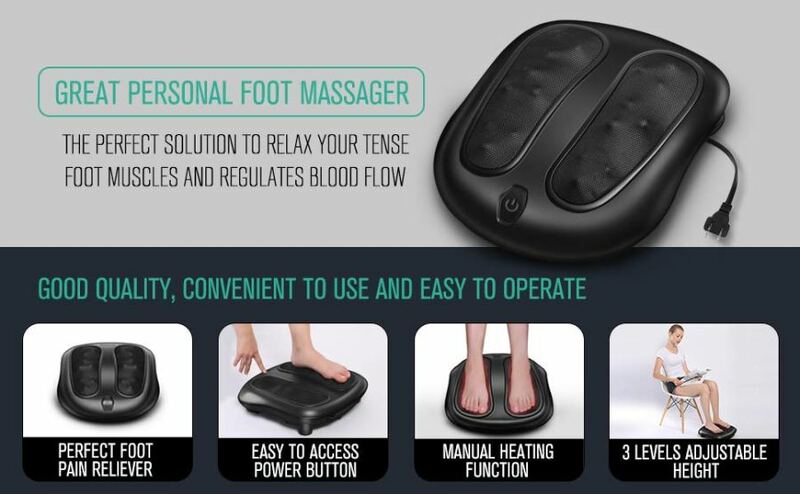 This powerful electric massager has a full-sized oscillating footpad with an arch bar too, which means it’s easy to customize plus very effective. The pressure point targeting surface is especially useful to stimulate blood flow in your feet and legs, therefore improving circulatory issues associated with diabetes or neuropathy. This massager is designed for therapeutic and clinical use, so it’s CSA and FDA-certified. Apart from improving circulatory problems, it can also reduce swelling and decrease joint pain. 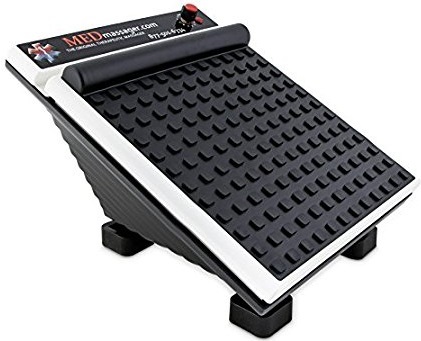 Besides, the MedMassager is a sturdy, reliable product that comes with its kit for use on slippery surfaces or hardwood. On the other hand, this massager doesn’t have heat or an adjustable angle to use it while standing, plus it’s pretty loud. Summary: The MedMassager MMF06 is one of the most powerful electric foot massagers, designed for clinical use. The Nekteck Foot Massager is your best choice if you have a tight budget because it boasts some quality features at an affordable price. For instance, the 6 massage heads with 18 rotating massage nodes are great for touching all your pressure points, relax aching feet and ease tension. The heating function helps improve blood circulation and unwind sore muscles. However, its open design means that only your soles are being targeted. To relieve plantar fasciitis pain or chronic foot pain in general, it’s wise to target your Achilles’ tendon as well as your metatarsal bones. Still, I liked how easy to customize the Nekteck foot massager is thanks to its 3 levels of adjustable height, plus it’s easy to use and carry. On the downside, the penetrating Shiatsu massage might be too powerful if you’re a hobbyist user and it might also not work very well if you have high arches. 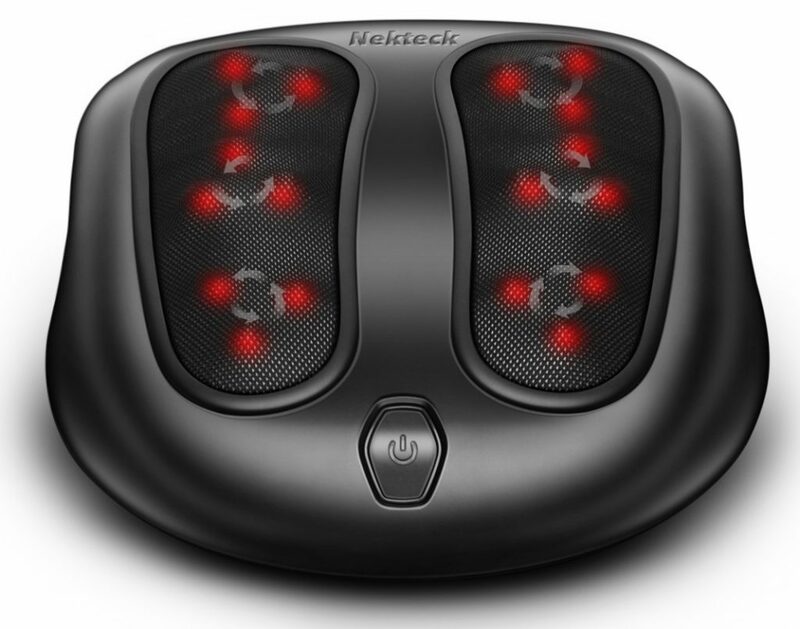 Summary: The Nekteck Foot Massager is a powerful and affordable Shiatsu foot massager, although it has an open-foot design. The Pure Wave Massager is handheld and versatile, with an ergonomic handle that allows you to hold it comfortably in your hands while targeting your soles, feet, lower back, and even your face. The dual motor design is powerful, and this is a cordless device, with a rechargeable lithium-ion battery which offers a thorough percussion massage. The 6 included massage heads allow you to adjust the massage intensity and style, though the overall massage isn’t very deep-tissue unless you use the Point Stick. On the other hand, the handheld design might have some disadvantages. While this is a versatile tool, it doesn’t support your feet or massage all pressure points at the same time. Plus, it doesn’t have heat therapy. 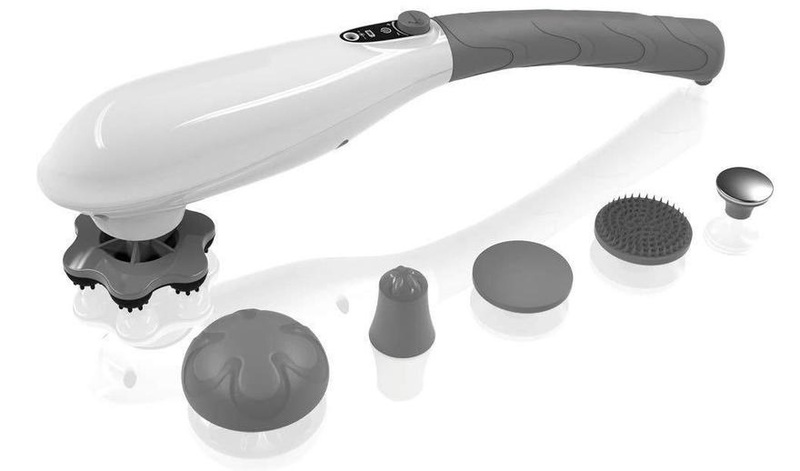 Summary: The Pure wave Massager is handheld, powerful and ergonomic, with a versatile design that allows you a full-body massage. 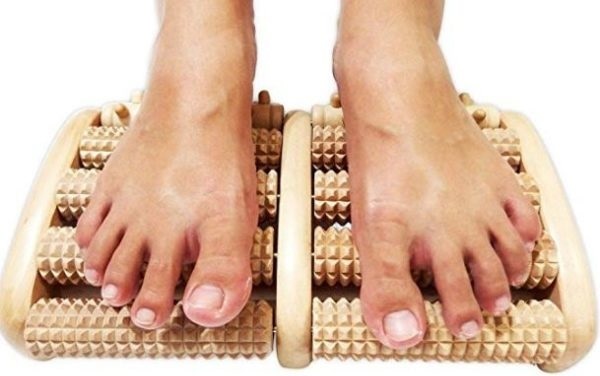 The TheraFlow Dual Foot Massage roller is intended to prevent chronic pain from plantar fasciitis or neuropathy and improves blood circulation. This manual massager touches acupressure points, features a lifetime guarantee, not to mention it’s perfect for all foot sizes. This portable and durable massager is made from polished Theaceae wood and offers soothing pain relief. However, since it’s a manual foot massager, there are no perks like heat or vibration. It also has a pretty strong smell when you unpack it, and it’s definitely not for people with ticklish feet. Summary: The TheraFlow Dual Foot Massage roller is the best top manual Feet Massager because it’s durable and uses acupuncture to improve blood flow. 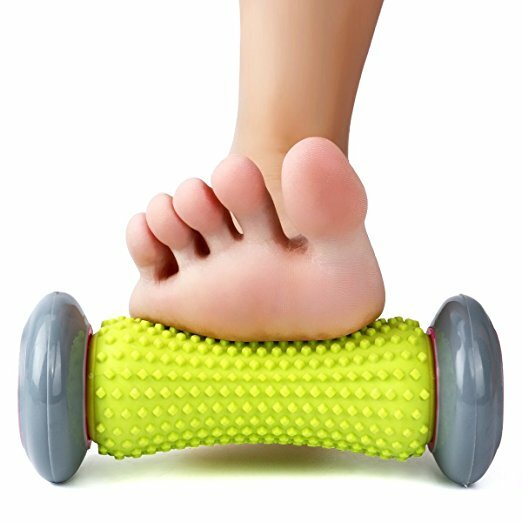 Another manual foot massager, the Pasnity massage roller is best for treating arch pain thanks to its cylindrical shape and spiky design. Besides, the foot roller is resistant and won’t lose its arch-friendly shape because of the durable combination of PU and TPE materials. Pro tip: massaging your arch is the best way to prevent plantar fasciitis. Plus, the acupressure reflexology design allows you to improve blood circulation, reduce pain, relax and decrease swelling. The massage roller comes with two included spiky massage balls, made from PVC. These are versatile tools that allow you to massage any sore body part, from your neck to your feet, though they feel a bit hard. With a lifetime guarantee and 1-year money back guarantee, the downside is that you don’t have built-in heat, vibration and can only cover a limited surface with this massager. On the other hand, the Lawei foot massager has the same acupressure-design spikes, plus it has all the benefits of an electric massager. 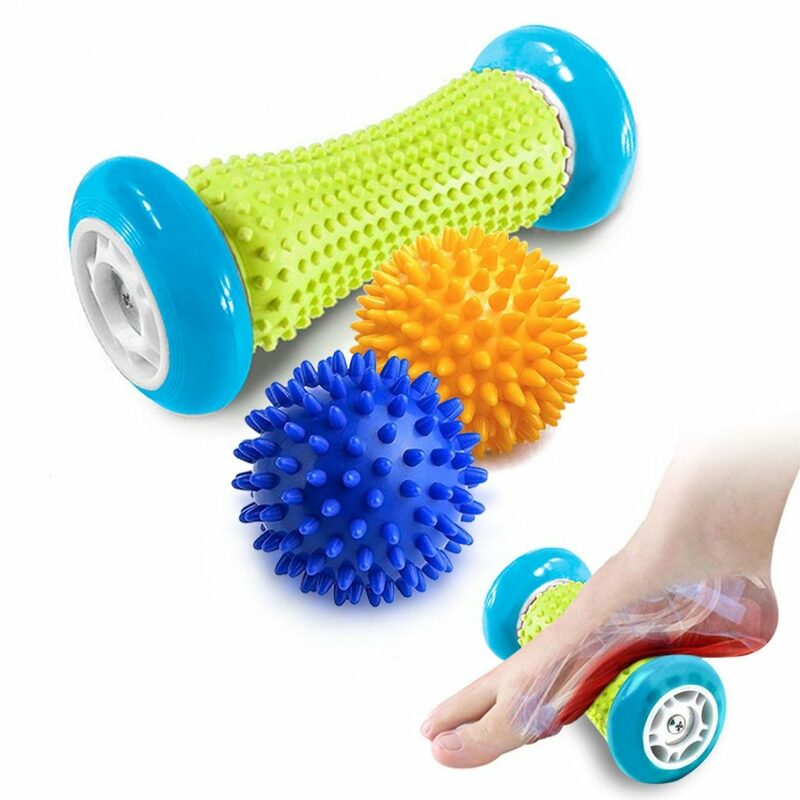 Summary: The Pasnity Foot Massage Roller has a spiky design and an ergonomic shape that make it perfect to treat arch pain. Manual foot massagers are the most durable because they can’t malfunction or short-circuit. They’re versatile, you can use them from head to toe, plus you’re the one controlling the massage intensity, speed and time. On the other hand, they require effort; you can’t just sit back and relax, letting the massager do its job. They don’t include heat and vibration either. 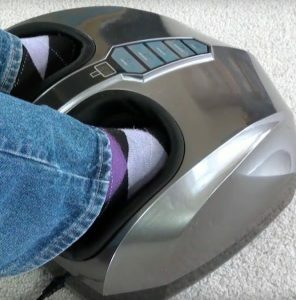 Electric foot massagers offer all the benefits of heat, vibration, and various massage techniques, though they have a shorter lifespan than manual massagers. You can choose a handheld device if you want a more versatile massage, but this covers a smaller surface. Open-design foot massagers are more affordable, but they touch fewer pressure points and thus are less effective for treating chronic pain. Shiatsu foot massagers are the best for relieving pain from plantar fasciitis thanks to Shiatsu nodes. Although these products are more expensive, they offer a more deep tissue foot massage for Plantar Fasciitis, possibly in combination with heat or air massage. Is a Foot Massager Good for Plantar Fasciitis? Yes, but it depends how bad your plantar fasciitis is. Sometimes you might need physical therapy or to do some specific exercises, but foot massagers can successfully be added in the mix. HOW A FOOT MASSAGER CAN HELP WITH PLANTAR FASCIITIS? 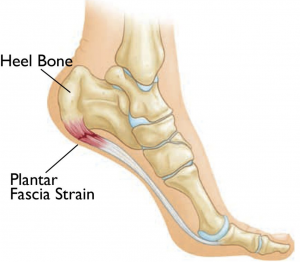 If you have plantar fasciitis, that’s because your plantar fascia is under a lot of pressure. A good foot massager should stretch the plantar fascia, as well as your Achilles tendon. Manual foot massagers that relieve arch pain are good in preventing plantar fasciitis because they improve blood flow and keep the plantar fascia stretched. The Miko Shiatsu Foot Massager is hands-down the best pick for stretching your plantar fascia and Achilles’ tendons in order to reduce plantar fasciitis pain. The other foot massagers are great in preventing this sort of pain too because they offer a comprehensive sole massage that keeps the plantar fascia stretched. Otherwise, you can see some very diverse products here – choose according to your needs! And once you’ve made your choice, come back here and tell me all about it.